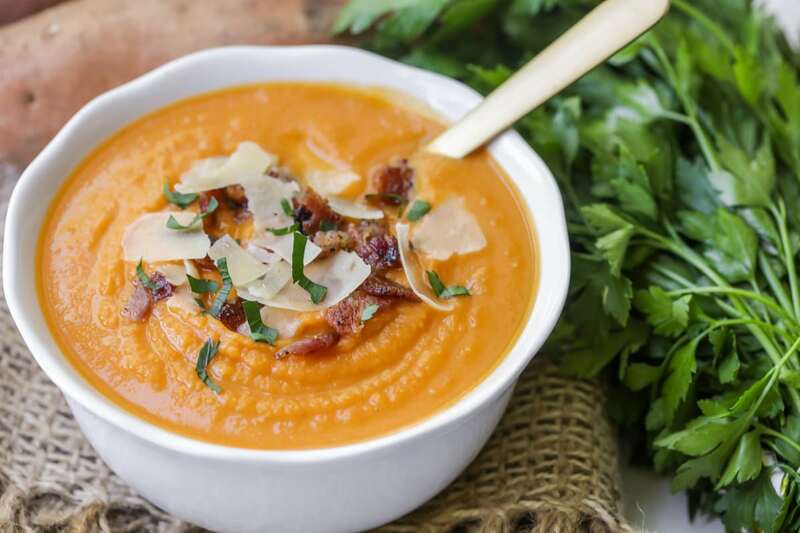 Creamy and smooth sweet potato soup that is topped with a little parmesan and a little bacon. 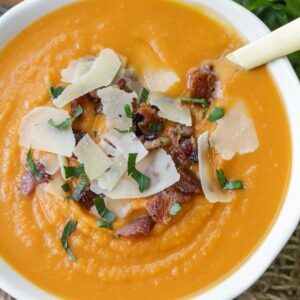 This savory soup has a bit of nip and is the perfect soup recipe for anyone who loves sweet potatoes. 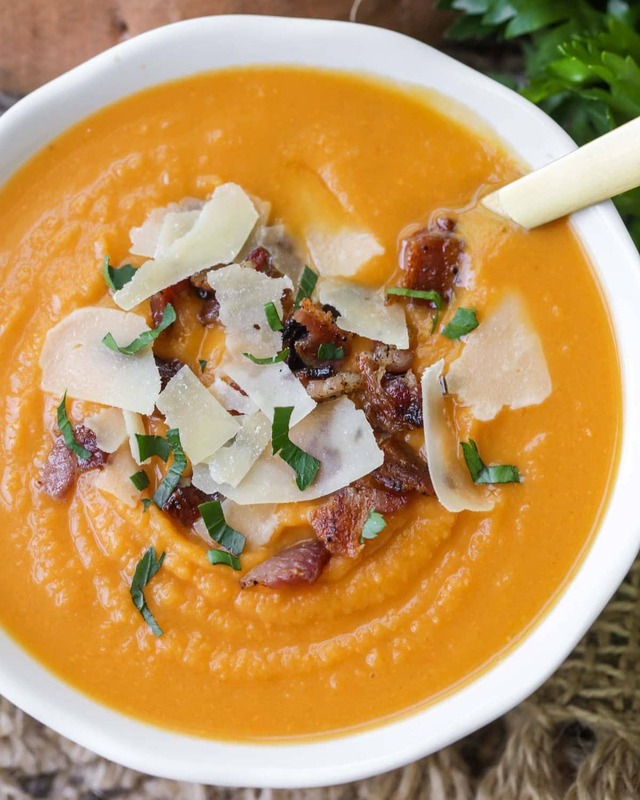 You’re going to love the creamy texture of this sweet potato soup. It’s so delicious that you’ll want to eat this weekly. I love a good soup recipe. It’s always so easy and so filling. 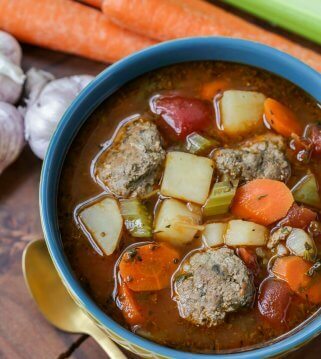 My family loves soup so this recipe is a hit with everyone who tries it! You can serve it alongside a sandwich or some crusty bread for a full meal. But it’s also super yummy on it’s own. The flavor of this soup is incredible. The pureed sweet potatoes mixed with the herbs are divine. There is a pinch of crushed red pepper that gives it just a hint of spice. If you love the combo of sweet and a little spicy then this will become your new favorite soup. 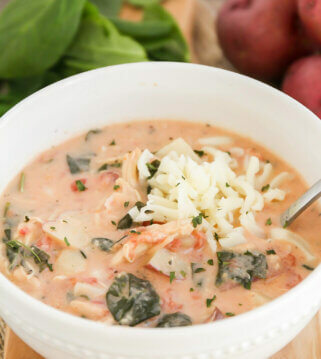 This sweet potato soup is perfect for a rainy day! It’s the best comfort food. Fall is just around the corner (next month!) so definitely put this recipe in your rotation when those leaves start to fall. Start by cutting up the potatoes and putting them in the microwave on high for 15 minutes. Check occasionally to see if they are tender. Take them out and let them cool a little bit. Then remove the potato skins. In a pot over the stove, boil the chicken stock, onion powder, cumin, and red pepper. Using a blender, blend half of the stock mixture and half of the potatoes. Make sure to remove the middle part of the blender top to let the steam escape. Puree until the mixture is smooth. Pour this into a large bowl and then repeat with the remaining other half of the stock mixture and sweet potatoes. Don’t forget to add some salt. Pour the soup into warm soup bowls. I love the pretty orange/yellow color of this soup. It’s gorgeous. 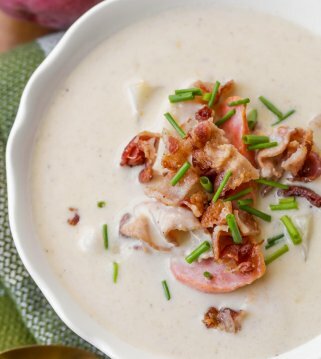 Top the soup with parmesan shavings and bits of crunchy bacon. You can add a little parsley garnish to give it some color. How do you like your soup? On it’s own or on the side of a sandwich or some crusty bread? You could even dip pieces of grilled cheese into it. Soups on! Cut potatoes in half length wise and place, cut sides down, in microwave-safe baking dish. Add 1/4 cup water and cover with plastic wrap. Microwave on high for 15 minutes or until tender. Let the potatoes cool slightly and remove skins. Boil chicken stock, onion powder, cumin, and red pepper in a pot. Place half of stock mixture and half of your potatoes in a blender. Remove center piece of blender lid (to allow steam to escape). Then puree until smooth. Pour into a large bowl and repeat with remaining. potato and stock mixture. Add salt and divide among soup bowls. Sprinkle cooked bacon and Parmesan cheese evenly over top. Garnish with parsley. What a nice recipe for rainy days. Thank you for sharing!! I have a hand blender so it will be very easy to make this soup. It sure is! I sure hope you like it! Thank you! Yum! Fall can’t get here soon enough! I need this in my life! I agree!! Love soup season! 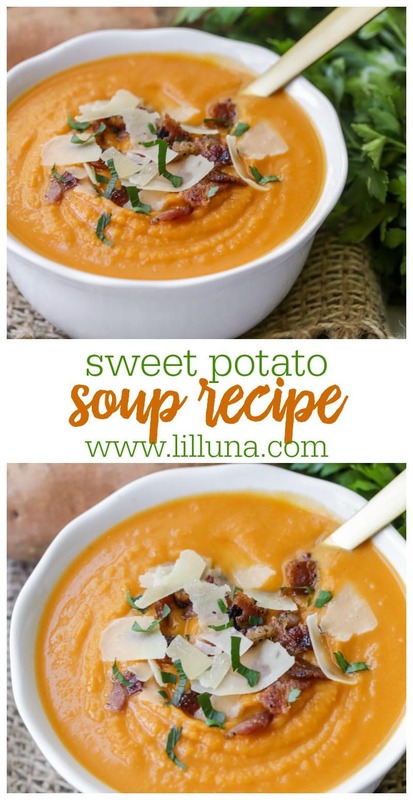 love sweet potatoes, they’re one of my favorites, but for some reason have never made a sweet potato soup, so thank you for this recipe! Great round up of meals that would be great especially once school starts again. Yum! Love this fall infused recipe! That looks sooo delicious, I love the vibrant color! Can’t wait for you to try it 🙂 It is so good! Thank you! 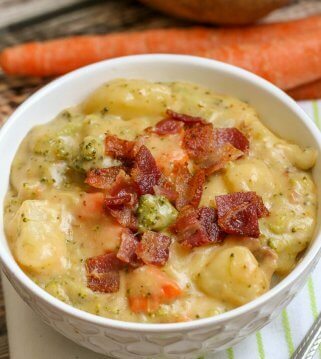 Such a perfect fall comfort food! 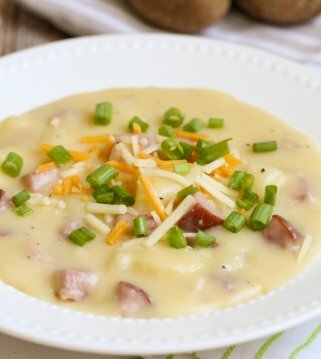 This looks like the perfect fall soup! It is 🙂 Thank you so much! I hope you’ll give it a try when the time comes! 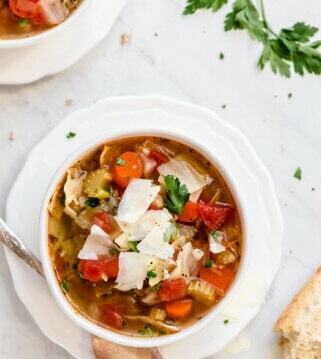 This soup has me craving all of the fall flavors! So smooth and delicious! I love sweet potato soup! This sounds delightful. You’ll have to give it a try 🙂 We loved it! Thank you! please keep sharing such homemade easy recipes because i love to make such yummy things. I sure will!! Thank you so much!